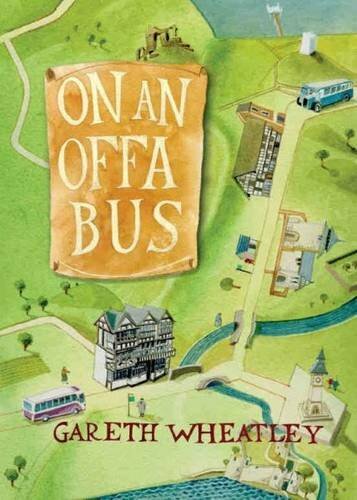 On an Offa Bus is a highly entertaining, humorous and informative account of ten bus journeys backwards and forwards across the Welsh/English border country where the author, with a sharp eye for detail, records the conversations he has had with the residents of both countries. `You don't have to go as far as Bleached Bones, Arizona to meet eccentrics, a journey through the shadowy borderlands between England and Wales will do just the same.' He travels the length of the border, from Prestatyn to Sedbury, calling in at Chester, Wrexham, Whitchurch, Oswestry, Llanfyllin, Shrewsbury, Montgomery, Kington, Knighton, Bishops Castle, Newtown, Leominster, Hereford, Ross-on-Wye, Abergavenny, Monmouth and Chepstow on the way. Throughout this highly readable book, there are underlying themes. Does a marcher or border person truly exist with no particular allegiance to either Wales or England? Do those who dwell on either side of Offa's Dyke have a passionate patriotism for their own country and countrymen? Does the duality of the region create an area that is particularly attractive to eccentrics? Somehow surviving the night, the little boy became a teenager and enjoyed the Australian way of life before returning to Britain and arriving back in Swansea with his parents and sister in the middle of what he remembers as a dank, late November day. Within a few weeks of leaving a mixed Sydney high school, which might have been transplanted from California, he was wandering around a British all -boys grammar school where masters wore gowns and some even tried to teach him Latin. It is little wonder the teenager tried to escape to a fantasy land through writing down dark thoughts on dark Welsh winter evenings. He is still writing today - film scripts, a dodgy novel and now On an Offa Bus, which he hopes will show that his thoughts are lighter than they used to be! The new passenger's tiny eyes, black as currants in a pale, soft face, flickered from side to side as he staggered down the aisle looking for a seat, and within seconds I knew, that despite thirty empty places, he was going to sit next to me. Some people are like that. I glanced out at rural Cheshire and hoped the one word answer would put him off, but I should have known better: this was a man who wanted company. His little rucksack suggested a day trip - what if he was going all the way to Shrewsbury? I was still thinking about the problem when our driver drifted into another high-speed corner. Halfway around, the newcomer's bulky body pressed me against the window like a specimen on a slide and I wondered about getting off in the middle of nowhere, because spending time with this man was not one of the ten things I really, really wanted to do before I died. He might have been staring down the bus, but I knew he was speaking to me rather than the huddle of passengers who sat up front. `Yes.' At least I was consistent. I hesitated while I thought about the options. He was right, it was cold and the next bus might not be due until the spring. He thought about that for a while, before turning his big, round face towards me and asking another question. `Yes.' He looked annoyed, as if I had just trumped his King. The man leant back in his seat with a small smile of triumph, while I thought about the reasons that had led me to this one-sided conversation with a dough-faced man on a bus bound for Shrewsbury. A month or so earlier, as autumn retreated to leave the stage clear for its harder, colder brother, I had walked down a lonely hilltop lane, looked east towards Cheshire and thought about the border between England and Wales. Did it matter these days? A woman had once told me that there are people who think they are `Border', rather than English or Welsh - was she right? Are there any real differences between the people who lived in towns on either side of the border, like Knighton in Wales and Kington in England? Are there any real differences in the towns themselves? The questions kept on coming. Has devolution in Wales begun to change things? Do people look across the border and like what they see? What was stopping me finding out? Maybe there might even be a book in it somewhere. After all, it was not as if I was going to some remote country where natives still sent messages using cleft sticks and thought that one day Bruce Forsyth would crack the American market. It should be easy, but as I turned for home, I bumped into my first problem - how would I travel? Trains did not run to most of the places I wanted to visit and a car would keep me away from the people who, with luck, would give me wit and wisdom. By nightfall, the matter was settled - I would go by bus. That was it, I would use service buses to zig-zag back and forth over Offa's Dyke, from Prestatyn on the north Wales coast to Chepstow in the south and talk to fellow passengers and people in the towns and villages en route. What about calling it `On an Offa Bus' or something similar? Yes, well, it sounded good to me anyway. I was on a roll, but then as vicious, lazy gusts of wind started to blow in from the general direction of Siberia, doubts began to surface. Would anyone talk to me? Would they think I had escaped from the big house on the hill? Would it be easy to find out the times of buses? The last question turned out to be one the biggest problems of all. Throughout my journeys, I was to find that information about timetables for rural buses was usually given out on a `need to know' basis. Well-meaning techno friends had a solution. Well I did, many times, and many times found last year's timetable, letters like NS, SO and XW, incomprehensible lines of numbers and strange symbols that could only be understood by people who can solve quadratic equations. Occasionally I phoned transport offices to be told that old Harry might be able to help, but unfortunately he was away from his desk looking for Lord Lucan. I knew I had to try other techniques. Have you ever tried getting information from one of those touch-screen displays? If you have, were you successful or were you arrested for battering the screen in frustration? But all that angst lay ahead: it was time to make a start, because today was meant to be a practice run for the real thing. I opened a black notepad, took out my best biro, half turned towards the man who had been to Warrington's cultural quarter and asked my first question.